Home > December 2017 > Share Investment Goldman Sachs 2018 Nifty 18% return..! Share Investment Goldman Sachs 2018 Nifty 18% return..! Share Investment Goldman Sachs 2018 Nifty 18% return..! 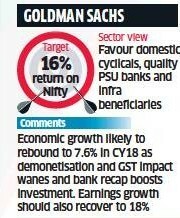 Reviewed by S Chitra on December 10, 2017 Rating: 5 Share Investment Goldman Sachs 2018 Nifty 18% return..!